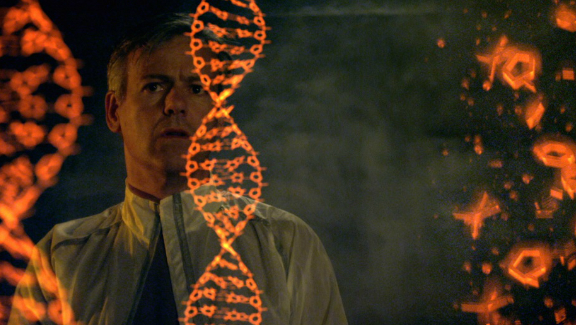 Daniel Fitzsimmons makes his feature debut with Native, a heavy science-fiction drama that follows two telepathic alien scientists, Cane and Eva (played here by Rupert Graves and Ellie Kendrick respectively), as they journey across the cosmos searching for the source of a strange musical signal. Linked to their home world’s hive mind, a sudden tragedy sees Cane’s link cut, which results in him going through a dangerous change that threatens his and Eva’s mission. As science fiction goes, Native is pretty impenetrable stuff. The focus on this particular alien culture makes it nigh on impossible to emotionally connect with the characters, especially as depicted here – all po-faced and bland, with every speaking character delivering their lines in a disinterested, monotone fashion. It’s difficult to love or care about characters that give very little back in the way of genuine emotion, and whilst the tragic story of Cane’s bereavement and subsequent descent into both obsession and depression has all the makings of genuinely involving human drama, the script and performance are found lacking and so it makes for a pretty stilted watch. From the off, Native hits the audience with what seems like a checklist of everything that makes sci-fi drama so cold and distant. It’s not impossible to make a film that focuses solely on non-human characters or civilisations, but here there feels like very little attempt to create something that isn’t just a mesh of half-baked science fiction ideas (the constant info-dump dialogue full of hard sci-fi jargon and techno-babble doesn’t help draw us in either). Colonisation, telepathy, hive minds, the perils of space travel, alien invasion, and genetic engineering? Native packs them all in. An entirely rushed ending muddles things up even more, with confusing and sloppy character motivations that don’t quite ring true. For all it’s flaws, the film at least offers some positives, though nothing that will bring you back for a rewatch. The production design work by Jon Revell is wonderfully unique, minimalist yet visually arresting, whilst the same can be said of Nick Gillespie and Billy J. Jackson‘s stark but impressive cinematography. And whilst the script and the characters may not offer much to work with, Rupert Graves still manages to eke some subtle yet no-less powerful moments in his performance. If you like your science fiction more emotionally investing and light on those hard genre tropes, then Native is best avoided. The production values and direction are up to scratch, but the script provides little to emotionally engage with, resulting in a rather flat and altogether soulless story that is as uninviting as space itself. NATIVE is in UK Cinemas & on Demand from Friday 23rd February 2018. Tags: Billy J. Jackson, Daniel Fitzsimmons, Ellie Kendrick, Film Reviews, Joe Macaulay, Jon Revell, Leanne Best, Native, Nick Gillespie, Rupert Graves, science fiction. Bookmark the permalink.